If you have never owned a Bengal cat before and might be considering bringing one into your home, it’s probably a good idea to learn as much about them as you can. One good way is to consider buying a book about them to find out the information you need to be able to better understand them. In this article we cover the following. Bengal Cats. Bengal Cat Owners Manual. Guide to owning a happy Bengal cat. The more information that you have on hand about Bengal cats the better. Yes, you can find a lot of information on the Internet such as our own site that offers information on personality to the best cat beds and more. But sometimes having a book on hand when you don’t have time to look up the information online is a good thing. Plus, books can be taken anywhere you go including places where there might not have an Internet connection. Books on Bengals can help you with a lot of questions that you might have regarding this breed. You can find out a lot about their breed especially whether or not your cat really is a Bengal. Descriptions and pictures can be quite helpful. Books offer information about different health issues Bengals might have and help you recognize signs or symptoms of various illnesses so that you will be well informed on what should be done if something is wrong with your Bengal. You can find books that help you better understand Bengals and their personality traits as well as learn how to get along with a bond with your Bengal. You can learn how to train your Bengal and what types of things you can train them to do. Books are a wealth of information when it comes to the types of toys they will be most interested in and how you can give them a home that is interactive and safe for them. Books can also be a great talking piece when you have visitors over who want to know more about your Bengal cat. They can also be a great source of entertainment especially if you purchase one that’s a coloring book just for adults. We decided to check out some of the books written about Bengals so that we could come up with a list of our favorites for recommendation to those of you who are looking for a book to find more about Bengals and get a better understanding of who they are and how to become a better pet parent. Below you will find a list of books that we believe you might find helpful in raising and living with a Bengal cat. ABOUT: This is paperback book that was written by a veterinarian about Bengal cats. It's meant to be a simple guide for pet parents who want to learn more about the Bengal breed. It’s a short read but offers important facts about Bengals that answers a variety of questions one might have. FEATURES: This little guide includes a fact file with all the important questions one might have about Bengals. It also includes information about their character, history, health issues and even a guide for Bengal kitten care. It also includes lots of helpful advice in caring and understanding your Bengal. PROS: Offers plenty of information for those who are relatively new to the breed. It includes a guide for choosing a Bengal, health information, equipment and accessories you should have and good advice on Bengals. CONS: Come complain that the information is too general and not specific to the Bengal breed. ABOUT: This book is written from the perspective of a cat and gives advice. A unique approach to those looking for a text about Bengal cats in both the approach and information offered. FEATURES: This is information taken from the author's experience with her Bengal to help people better understand what makes Bengals unique. PROS: The book gives information on both Bengal kittens and cats including their behavior, markings, history, IQ, ticks they can be taught, games to play with them and more. ABOUT: This book is meant to provide the reader with useful information explaining the different aspects of this beautiful breed, their care, training, health. It includes steps and strategies on how to better understand Bengals in order to make them an important member of the family. FEATURES: This book guides pet parents through everything from picking your Bengal out of the litter, their origins, what you can expect of a Bengal, caring for them, training tips and much more. PROS: Nice little book on Kindle and paperback that offers a good amount of information on the breed and what you can expect from them once they are in your home. Much of the information is meant to help people find out whether or not they have the lifestyle that most Bengals require to live a happy and healthy life. CONS: Not really meant for those who are already knowledgeable about Bengals. ABOUT: This book is ideal for the beginner and is meant to introduce people to Bengal cats. It is meant to help guide those pet parents who are just getting to know their Bengal and want to learn more about the breed plus how to care for them properly. FEATURES: This paperback book is convenient to have around especially if you are new to the breed. It includes information on how Bengals compare to other breeds of exotic cats that also have wild ancestors. It also includes information on any legal considerations there might be in the US, UK, and Canada as related to the generation of Bengal one might own. PROS: This book gives the reader TICA information on Bengals as well as any legal issues there might be. The book specifically defines their specific needs and what to expect from Bengals. It’s also very easy to read and understand. CONS: The photos in the book are nice, however, they’re not in color. ABOUT: This paperback book is intended for those who are new to the breed and looking for general information about Bengals to help them learn how best to care for them and how to bond successfully so both the pet parent and the Bengal will have a great life together. FEATURES: This book tries to reassure those who are new to the Bengal breed that even though they come from a wild ancestry doesn’t mean that they are wild cats. This book tries to teach people how loving and sweet these cats can be. PROS: Explains well how Bengals are not to be considered wild and that they're ideal for families and people who love cats period. It ensures them that these cats are not just beautiful and intelligent but are fiercely loyal as well as loving. CONS: Big drawback is that there are no illustrations or photos. 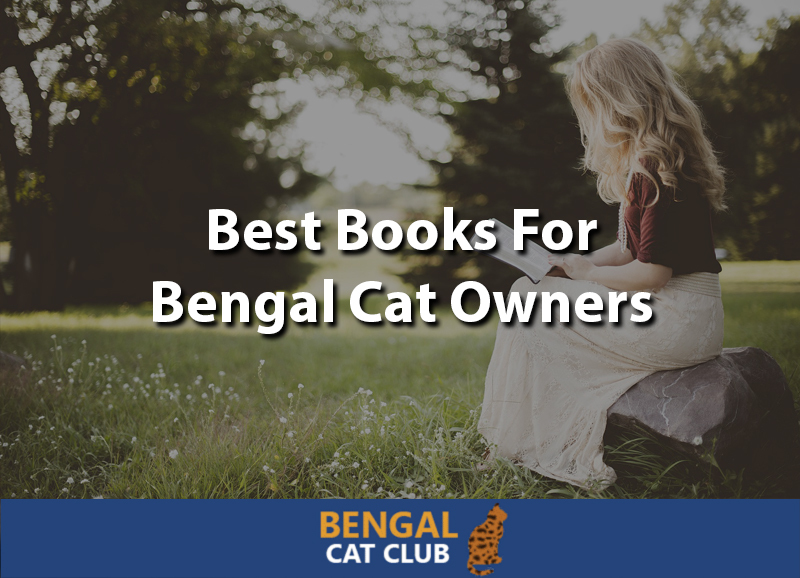 After reviewing these five books on our list, we’ve come to the conclusion that our top choice would be the Bengal Breed Profile. We believe that this small yet informative book is one that meets most of the criteria that many are looking for when wanting to learn more about Bengals. It’s easy to read, is inexpensive and holds far more information than one might think it would. Each book on this list offers information that is important to know and all of them can be helpful. It simply depends upon what you are personally looking for in a book about Bengal cats.